What makes Anthony Davis so good? We asked the Pelicans star himself. Editor's note: In honor of the NBA 2015 All-Star Game, American Express is launching PIVOT, an innovative feature on NBA.com that allows fans to see stars' signature moves unlike ever before. One of the stars participating is Anthony Davis, who recently spoke with SI.com. 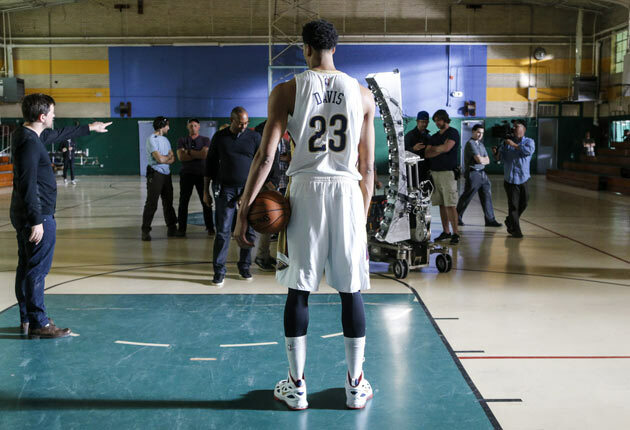 From Anthony Davis' vantage point, the rest of the league must look so small. He stands 6-foot-10 but plays even taller, vaulting upward through long arms and trampoline bounce. That physical force translates directly as basketball influence. His current PER would go down as one of the four best marks in NBA history alongside Wilt Chamberlain, Michael Jordan, and LeBron James. At 21 years old and in his third season, Davis has become a titan. Already he breathes rarefied air. Yet unlike Davis' statistical peers up on basketball's Mount Olympus, his view of the game comes without condescension. So many of the NBA's finest were (and are) driven by proving their superiority to their competition. Davis, by contrast, is as good as he is because he takes his every opponent as a serious threat. "I think a lot of guys [in the league] don't respect everybody on the floor," Davis said. "Everybody is in the NBA for a reason. Everybody can go out there and have a big effect on the game." Davis' appreciation of that fact has brought about a terrifying reality: A superstar who never seems to overlook the opponent in front of him. Davis does not play down to his competition. He doesn't make a show of proving his man can't guard him, even though none can. He treats every matchup as if it deserves his full, unwavering attention and thus delivers full, unwavering dominance. His is a view from the top of the basketball world and yet Davis measures up opponents as if they were somehow his equal. ​"I want to be a guy who works hard, who plays hard, plays for his team, doesn't care who scores as long as we get the win," Davis said. "If you need a big shot or defensive play, I want to be the guy they go through. I'm not quite there yet. I've got a lot of work to do but I'm willing to do the work." Davis is right about the work ahead, if less so about his current standing. Already he's the player just described – putting up crazy numbers across the board, shooting a jaw-dropping percentage in crunch time, and turning up time and time again with possession-saving defensive plays. That Davis honestly sees himself as a work in progress, though, is instrumental to his ascent. That much has been the case since Davis entered the league in 2012 as a franchise-changing prospect. The conensus No. 1 pick was snatched up giddily by the Pelicans, who then faced the privilege and pressure of molding one of the great natural talents the league had ever seen. In some regards, Davis needed little assistance; even as a rookie he ranked among the league's best pick-and-roll finishers while pulling in rebounds and swatting out shots at impressive rates. The team instead focused on Davis' inconsistent jumper as the first major developmental project of his career, laying the groundwork for what would become a shockingly lethal tool. Construction began with Davis' form. "I used to shoot from my chest – from my chest to my face to the rim," Davis said. "I could never really see the rim. The ball would get in the way. So I kinda changed my shot more to the outside of my face on the right side and shot a little higher so I can always keep an eye on the rim. Make sure the ball's coming off the right finger every time, holding my follow-through, making sure my feet are square. I had to change a lot. "It felt weird, and it felt like I was doing everything wrong – especially with what I was accustomed to." Thus began the tedious work of shooting thousands of jumpers to groove the new form. Repetition was the only way to clear Davis' shooting sight line, and so beginning with his rookie year and stretching into his first NBA offseason, Davis put up more shots than he ever had in his life. The developed product, as showcased in this post by Grantland's Kirk Goldsberry, is striking: Davis has become one of the NBA's most accurate jump shooters from the top of the floor. His success there comes by design. "I thought it would be the easiest shot – a straight-on-shot – because it's just like a free throw but it's a couple steps back," Davis said. "It's the same shot, you just jump. As I've started knocking down that shot I'm trying to make sure I get the mechanics down from that spot. Once I get my mechanics down, we'll try to move around after that. It'll be the same shot just a different angle." Davis has progressed so much so quickly as a shooter that he tabbed his jumper as his signature move in this deconstructive feature from American Express. That in itself is a radical development given that Davis shot 34.6 percent on jump shots as a rookie, many of which were surrendered by a defense that saw no reason to defend Davis closely at range. With such dramatic improvement in his shooting (Davis is up to 42.3 percent on jumpers overall and near 50 percent from the top of the floor), Davis antiquated that approach quickly. "I think a lot of teams are listing me as a good shooter from mid-range there and trying to contest high or have some guy stunt at me to try to throw me off," Davis said. "That's where, if you knock down a couple shots, a pump fake comes in and moves off the dribble come into play." This is where Davis hurdles the line between difficult and impossible. A big man with a jumper is a catalyst. A big man with a jumper and the ability to make moves out of the triple threat at Davis' level of proficiency is a superstar, full stop. No longer is Davis reliant on ball handlers for lobs or offensive rebounds for put-backs. He makes his own opportunity, in many cases, by facing up his man from the post or mid-range and putting an outmatched defender in an impossible bind. Davis starts dissecting his opponent from the ground up. "It starts with his feet," Davis said. "If he shades me toward the middle, of course I'm going to take the middle. But if he's square, I'm going to try to make one of my moves that I like doing." "A lot of guys know I like to go baseline, so they try to force me middle. That's where knocking down a couple shots – one-dribble pull-ups – come in, so that way they have to square you up instead of shading you one way." ​Basketball is best understood as this kind of reactive process. There is a pervasive thought in sports that the best players and teams should "do what they do" – to dominate in the same ways they always have regardless of competition. The variety of personnel and strategy in a league like the NBA fractures that idea to its core. Elite play isn't the product of simple talent winning out through blunt force. It's largely a function of smart, intuitive players reading situations and reacting accordingly. "Usually when a guy is bigger or stronger, they try to take a couple steps back to give you space so that if I drive, I won't just go by him," Davis said. "So I try to knock down that jump shot maybe two or three times." "That way they have to pressure me and I can use my quickness to my advantage to go right around them and finish at the rim. When you have bigger, stronger guys, I definitely try to give them a jab [step] or a move where I throw them off balance and knock down the jump shot." For those players who can manipulate defenders as easily as Davis, the game opens up. He'll get the first step on an opponent who guards him too closely and knock down a jumper on those who give him room. His footwork – which largely goes unnoticed – has developed to the point where he spins into scores with ease, allowing him another avenue around even well-positioned defenders. Then, without the ball, Davis might be even more paralyzing: To give his cuts and rolls too much attention leaves open capable scorers and to give them not enough all but invites a lob and dunk. There are never easy answers with Davis on the floor. The same is true on the other side of the ball, even as Davis feels out the nuances of anchoring an NBA defense. It's there that he has more to learn, as he'll freely admit. The pacing of an NBA possession is furious and physical, and the responsibilities of a defensive captain like Davis are robust. Every trip down the floor brings the pull of competing duties which must be balanced in rhythmic time. Month to month Davis improves, though he still sees room to work in the way he defends the NBA's speediest guards. "There are a lot of these guards coming off screens," Davis said. "They're so fast and dynamic and explosive that it's tough to stay in front of him. I think I'm a pretty good perimeter defender when we have the switch, a big on a guard. But Russell Westbrook, for example, he's so dynamic and explosive to the basket that it's hard to stay in front. He ends up getting easy layups." "That's an aspect of my game that I'm trying to get better at – making sure I try to stay in front of these guards when we have to switch and in late-game situations or late in the shot clock. Try to make sure I can stay in front of the ball." "The biggest thing is making sure I give them enough space where if he makes a move or tries to attack, I can react and stay in front." Davis said. "I know that a lot of guards like to shoot on bigs and take a three or a pull-up jumper. So when you give them that space, nine times out of 10 they're probably going to shoot it. So you're sagging off, but my length plays a part as well just being so long and being able to contest even when I'm three or four feet back." Davis has plenty of other tricks to get the best of his defensive mark, but most of his big plays are of a more harrowing (if pedestrian) sort. Come to the rim against New Orleans and Davis will be there, ready and waiting, with a catch-all 7-6 wingspan. His work is similar to that of so many bigs across the league, and yet even in the capacity of rim protection Davis can't help but trade in the spectacular. This is where Davis lives now, in a basketball sense. Leave him on the court for any significant length of time and amazing things happen all around him: improbable rebounds go converted on tip dunks, complementary scorers thrive in the space he creates, and the Pelicans' offense soars to top-five efficiency. All of this is possible because of the player Davis has worked to become. What destruction might he bring upon the NBA if he ever grows into the player he aims to be? "I definitely want to be a dominant player in the league," Davis said. "I know it's a lot of hard work and a lot of dedication. A lot of sacrifice. I'm willing to do so."